Oooh...sounds like a fun giveaway!! I love your blog and have been reading for quite some time. It is only today that I realized I had not signed up as a follower! I have now!! 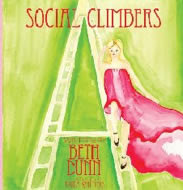 Please enter me in your wonderful giveaway as I adore Beth and her blog and would so love to have a copy of her book. Have a Happy Halloween this weekend! Yeah. I have been wanting to read Beth's book. I am already following both of you and I read your guest post on her blog today. Love both of your blogs! What a wonderful giveaway Miss SLPS, Beth is just amazing! May the rest of your week be wonderful! Oh how fun! I've been dying to read this. I'm a follower! I love your blog, and would love a copy of this book. If I don't win, it's going on my christmas list! Loved your interview with Beth. I discovered it is what it is way back when TOHB came out in the 80's. Somehow is is comforting to know that there are others out there that are like minded. Fun all the way. Your little daughter is adorable, love the blonde pony tails.